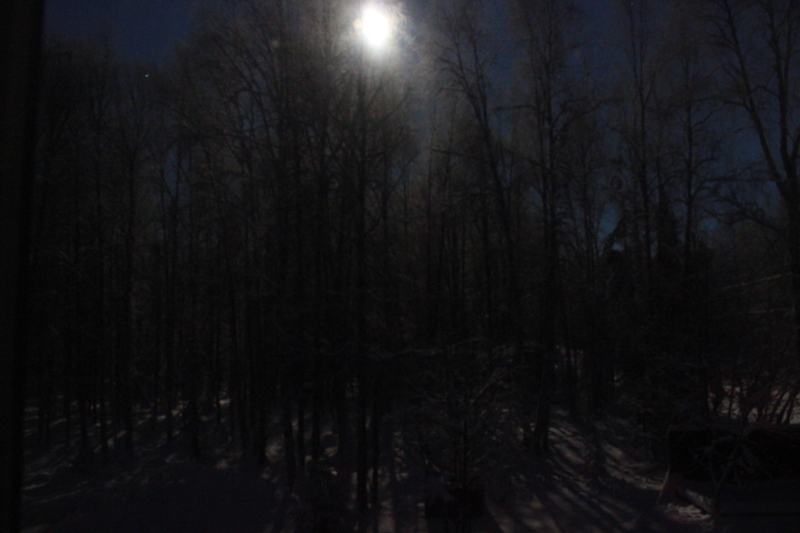 Moon | Alaskan at Last! Maybe ten days back I decided to take a brief morning walk along East Barge Drive which is the dirt road, now finally snow packed, that runs by my place. Given the time – around 08:30 – it was naturally pitch black and the recent overcast prevented seeing any light from the waning moon. The air was crisp but not terribly dry and there was no wind. Given the air temp was 4.8° F, and this was warm after seeing -12.5° F yesterday morning, I was quite comfortable in my layered outer wear. We have a 14.25″ snow pack and thanks to little wind across the past two weeks all the trees are cradling many inches of light, fluffy snow on their limbs and boughs. I love this situation as the already extremely quiet environment is even more silent as the snow in the trees really does create barriers to sound propagation. In addition, I’ve always loved the ‘creeeeak’ created by compressing extremely cold snow. In this morning’s case the snow had just been subjected to over 24 hours of below zero air temps and hence was very cold. With each step my boots created what sounded like an extremely loud ‘creeeeak’ but said sound was almost immediately quieted by the conditions. Normally I wouldn’t take a walk with the kidz in dark conditions because of the potential to wander upon moose without seeing them from a distance. I decided to wear my headset lamp which was a first for me. Within a couple of years of living up here I noticed almost all the locals had a head lamp of some kind; given this I purchased one back in early 2015. I’d used it when working outdoors during dark times but never actually used it to take a walk. I was thoroughly enjoying seeing my small light beam bounce along as the snow creaked beneath my boots and my breath just hung in cold air. Many times I would just stop, turn off the head lamp and enjoy the calm silence. During one of said stops the overcast produced a small gap which allowed the moon to briefly shine through. The effect was breathtaking as the surroundings literally flashed with bright white light yet everything remained dead quiet. I guess given the incredible flare of moonlight I expected some sound..? Seeing this literally took my breath away and I struggled to get my pocket camera free from my vest pocket which was inside my Eddie Bauer rain jacket. Just as I did manage to pull it free the clouds once again occluded the moon and I was standing in darkness with the kidz milling around me no doubt wondering why ‘Dad’ had suddenly stopped. For the remainder of the walk I reflected upon that event; the amazing timing and series of events that had to coincide for that one moment to occur. 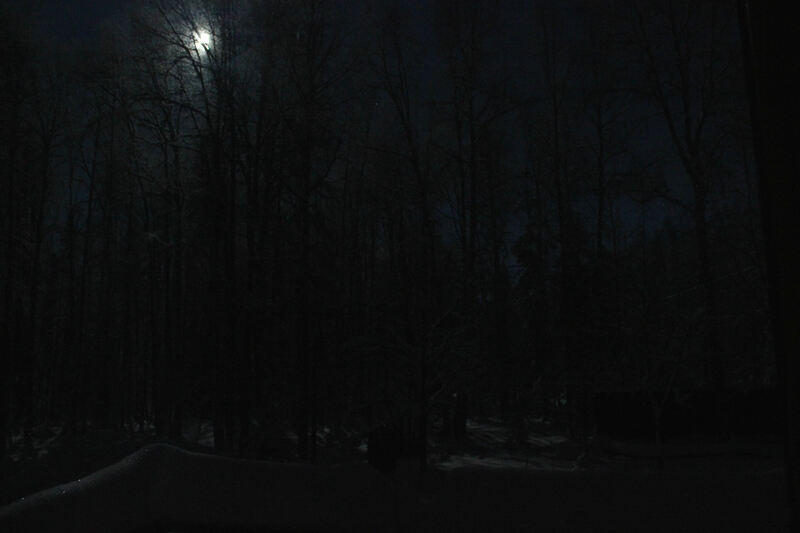 I had to be out walking in the dark and decide to turn off my headlamp at just the right time to allow my eyes to adjust to the darkness before that small gap in the overcast moved so perfectly aligned to allow me to catch the full power and beauty of the just now waning moon on the snow covered landscape. Such a myriad of ‘ifs’ that all fell together to create such an incredible sight! In turning this over and over in my mind I realized far too often I just perceive such wonders without giving any thought as to their genesis. In a way I am becoming somewhat jaded reading the majestic scenery of Alaska and that pains me. There is so much wonder and beauty – not just in ‘The Great Land’ but everywhere on our earth and in the heavens around us – everywhere if we are willing to just take a bit of time, absorb the wonder and then reflect upon it if only for a few seconds. I’ve assembled a few images taken yesterday (Wednesday) morning around 06:00 AKST. 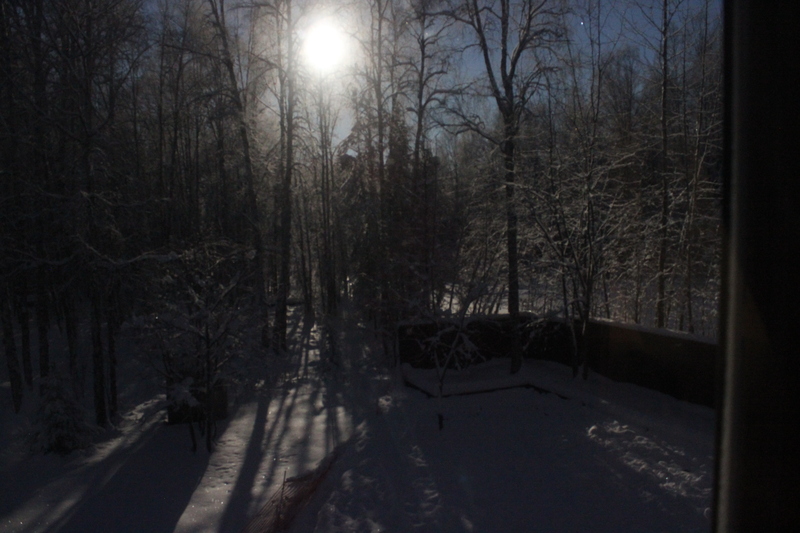 The air was crystal clear thanks to no fog and an air temp of -23 F. The images are mainly looking at portions of my back yard. I found it amazing that I could actually read printing on a large bag of dog food by just the light of the moon and through the dining room window at that!